I found this photo in a newspaper while I was doing research for the Cemetery of Choice. 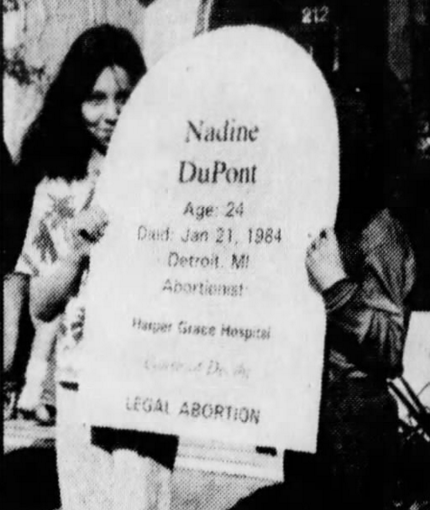 It indicates that 24-year-old Nadine DuPont died January 21, 1984 in Detroit, Michigan after an abortion at Harper Grace Hospital. If anybody has any information, please pass it along. UPDATE: Cheryl Sullinger of Michigan Right to Life provided a copy of a lawsuit filed by Nadine's survivors. While she did indeed die from complications of a suction D&C, it was performed to remove a molar pregnancy, which is a condition in which clumps of cells develop, rather than a viable fetus. Thus, Nadine was not in fact an abortion death. She was born Nadine S. Neumann on March 17, 1960 in Michigan. She attended Clintondale High School in Mount Clemens, Michigan. At the time of her death she lived in Rochester, Michigan.